UPDATE: Voting is closed. Thanks to everyone who participated in the poll. Reviews for the five rewatches are found below. That inner monologue tends to run through my head fairly often. It’s sound thinking, really. Great movies deserve to be seen again and again. A second viewing can be just as rewarding as the initial one, giving you time to appreciate the subtleties and craftsmanship more now that you’re not as focused on seeing the story unravel. “I can’t wait to revisit it”. That particular statement is a lie, though. I can very easily wait to revisit them. The proof is the pile of DVDs pictured above, DVDs that normally burn my eyes with shame as they pass over them on the shelf. 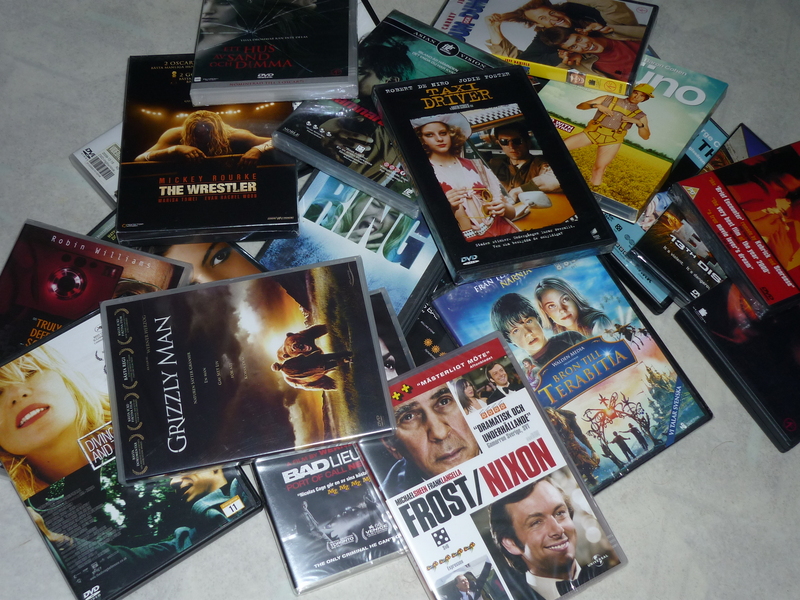 I like all these films, yet I never seem to find the time to pop them into the DVD player and give them a second whirl. Some of them I bought over three years ago. Granted, some are older favorites that I have indeed watched multiple times back in the days, but the basic problem remains: I’ve spent money on a DVD that I’ve never even opened. But now I’m doing something about it. The next five films I watch at home will be from this pile, I’ve decided. No rentals, no films borrowed from friends, no nothing. Five will be just the tip of the iceberg, of course, but a start is a start and the pressure needs to be alleviated. Perhaps it will lead to more. Also, I will probably do a little write-up here on the blog on the films I decide to rewatch too. So, five movies. But which ones? Please take a moment to vote below for the movies you want to see me review next. What do you think of these films? Are you also a neglectful movie owner? How horrible am i for leaving these films on the shelf for too long? Please leave a comment below. seriously i feel your pain. i too used to be like that. i had moives that just sat on my shelf for 3 years without being seen and then i ended up selling them as i left the country. a total waste of buying a good movie. i’m sort of getting that way again but im trying to resist the drawing power of buying dvd’s. omg i just looked the picture again and you haven’t even unwrapped some of them! Indeed, a few of them are unwrapped still. At least they won’t gather dust on the shelf. I have gotten better at avoiding this situation recently. I tend to reserve my DVD shopping for when I can find a sale or so. The fact that I’ve run out of room on my DVD shelves might have something to do with it. I’ve been making my way through rewatching several of mine as well. I feel awful when I realize that there are movies I purchased several years ago that I haven’t watched since then. Right now I’m refusing to let myself buy any new movies until I rewatch the ones I have now. That’s the spirit. Good movies deserve to be seen again. How big is your backlog currently? You might consider a DVD cataloging program like DVD Profiler (free version from Invelos.com). Not only does it let you keep an electronic catalog of your library, but you can record when you watch something. The main page can display various columns of data depending on your preference. I, for instance, have it display Title, Release Date, Purchase Date and Date Last Watched. As the Date Last Watched column fills in, it becomes easier to spot at a glance those neglected titles. You can also create a list of Users so you can track who you watched the movie with, and you can add brief notes. So, for instance, let’s say you pop in Up in the Air and watch that with a friend; you can create a User profile for that friend (it’s nothing complex; just their name) and tag the friend when you mark it as watched. Then, let’s say you follow that with Up in the Air but you decide to watch that by yourself with the commentary track. You only check your own User profile, and in the notes field you can type, “Commentary Track.” So later, if you’re looking at when the last time you watched it was, you might see that you watched it with the commentary track and decide whether that was sufficient or if you feel like it’s time for another straight viewing of the movie proper. There’s also a “Personalized” section where you can track when and where you bought the DVD, how much you paid for it, record your ratings on a 5-star scale (with half-star increments) for the movie, audio quality, video quality and bonus content. I appreciate that because sometimes there’s a great disparity between the quality of the movie and the quality of the bonus content and this way, I can express that–even if only to myself–without having to mentally combine them or ignore the bonus content. Incidentally, I’ve only seen six of your list and I voted for five; I omitted The Ring because it’s merely September now and I’m of the mind that’s a movie best suited for October as we near Halloween. But, of course, you’re Swedish and I have no idea if you celebrate this or, if you do, whether you link it with Horror films or if you celebrate in October at all. I don’t think I have much need for such a program, all things considered. I mainly just watch what I feel like. The main issue as I described above is when I buy a DVD and never watch the film. That’s just a waste of money, and is what I want to avoid. If I do watch a DVD only for it to then sit on my shelf for a long period of time, well, that’s okay. I can live with that. I have gotten some value out of it, and whenever the mood kicks in, I can go back to it. It’s a small difference in reality (at least when it’s a DVD I’ve paid full price for, something I very rarely do nowadays), but it’s enough of a difference for me. The extra functions you talk about isn’t really for me. It sounds impressive in the levels of detail it provides, but I don’t need to be that precise with my viewing history, I feel. There are exceptions, though. The DVD commentary stuff you mention, for instance, is something I might be able to get some use out of, but knowing me, I wouldn’t be able to use such a program without feeling the need to use all its features reflexively. I already have too big of a ritual to go through after I watch a film (post about it on a forum, rate it on a Swedish movie site, rate it at my rental service, check it at icheckmovies.com , rank it on Flickchart, check what some choice critics had to say about it and maybe tweet about it too). I don’t need any more, I feel. Halloween as you Americans know it is a fairly recent addition here in Sweden. It really started to get notable about 15 years ago or so, and has grown since. Children going around trick or treating is nowhere near as common here as in the US (to my knowledge and experience, I should add, since Wikipedia has a different opinion), but teens and young adults having costume parties is very much a thing now. I’m kind of stubborn in my refusal to embrace it, though. It’s very much copied exactly from the American way of doing it, and it seems like there’s no reason for us to do it other than to be more like USA. And while I have no problem with American movies, music and pop culture consuming us, having to import holidays is something I find really excessive. Especially since we already had Alla helgons dag (All Saints’ Day) that is minorly celebrated in the same timeframe. So there is no real impetus for me to watch horror films specifically for Halloween, is what I’m trying to get at. I’m terrible about this, or used to be. I’m getting moderately better now – mostly because I’m just stopped buying DVD, except for the occasional Criterion Blu-ray. But I have tons of discs that I’ve never watched since I bought them, but I figure I might one day, right? Right? But I also keep a lot around, especially classics and such like, just to have for blogging and studying purposes. I can’t tell you how many times I’ve needed to remind myself of just one little clip or take a specific screencap for a blog post, and having the DVD available to do that is a godsend. One time I needed some caps from Breathless (the cap sites weren’t giving me the exact ones I wanted), and I was pretty enraged to discover I didn’t actually own it. I traipsed around to two or three library branches before I got a copy of it. Yeah, having movies available to you instantly isn’t just for full watches. As you said, sometimes you need something for a blog post, wether it’s to grab a still image or just to check up on one particular scene you’re writing about, or maybe a line of dialogue or something. There have been a few time where that has really come in handy for me too.